Standing for the National Anthem before our opening match at the 2008 Beijing Olympics. 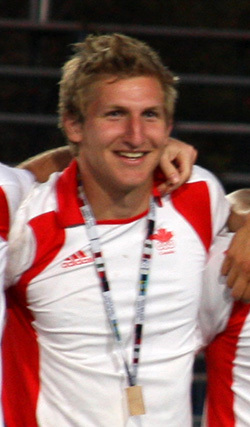 Winning the 2009 Pan-Am Cup in Santiago, Chile to qualify for the 2010 World Cup. CAN Fund will allow me the financial flexibility to focus on my sport and train like a professional as I move towards the London 2012 Games. 10th in 2008 Beijing Olympics / 11th in 2010 World Cup. Avid golfer, fisherman and general sports fan. Love to play practical jokes on my teammates, recently explained to one of our youngsters in his first Cap (National Game) that we always arranged by height during the pre-game walk-out. Things got pretty complicated from there and needless to say, this did not help his nerves! Only superstition would be the fact that I always tape three white stripes right below my grip on my stick, looks good and feels good.